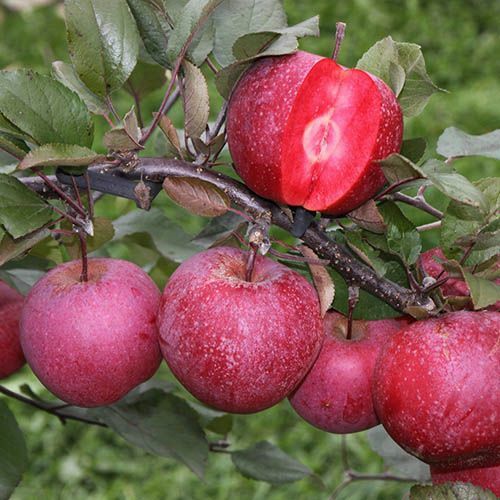 Now you can with new early garden variety Apple 'Tickled Pink'! A really unique variety with stunning juicy red flesh, ‘Tickled Pink’ is perfect for adding something a little bit different to allotments, mini orchards or to add to your collection of pots on the patio with a scrumptious old-fashioned sharp flavour. From fragrant deep-purple blossom in the springtime to luscious, red-fleshed fruits each October, ‘Tickled Pink’ will make the perfect addition to your ‘grow your own’ patch. Delicious straight from the tree, the exquisite apples are perfect for making refreshing red juice or baking apple pies for a taste that’s simply divine. If you’re not a big fan of baking, its incredible fragrant spring blossom and richly-coloured foliage, bring season-long interest to any garden, patio or balcony. As happy in a pot on your patio or balcony as it is in a bed or border, it is perfectly winter hardy and so easy to grow that it’s perfect for growing at home, even for a complete novice. Supplied on an M111 rootstock. It is lightly self-fertile, but crops are heavier where there are apple trees nearby and it is more likely you will get some fruit as it can be pollinated by a wide range of commonly grown trees. Plant it where you can enjoy the gorgeous spring blossom displays too! • Outstanding new variety – strictly limited stock! • Fabulous old-fashioned sharp flavour, like “Rosy Apple” sweets!